This authentic antique map with accompanying engraved illustrations from Chatelain's remarkable Atlas Historique shows the far-flung territories of the Mogol kingdoms along with some traditions of the civilizations in those places. Also included is the genealogy of Mogol emperors starting with Tamerlane, founder of the second Mogul dynasty, and ending with Ferrog Sier in the present time (Chatelain's present time). 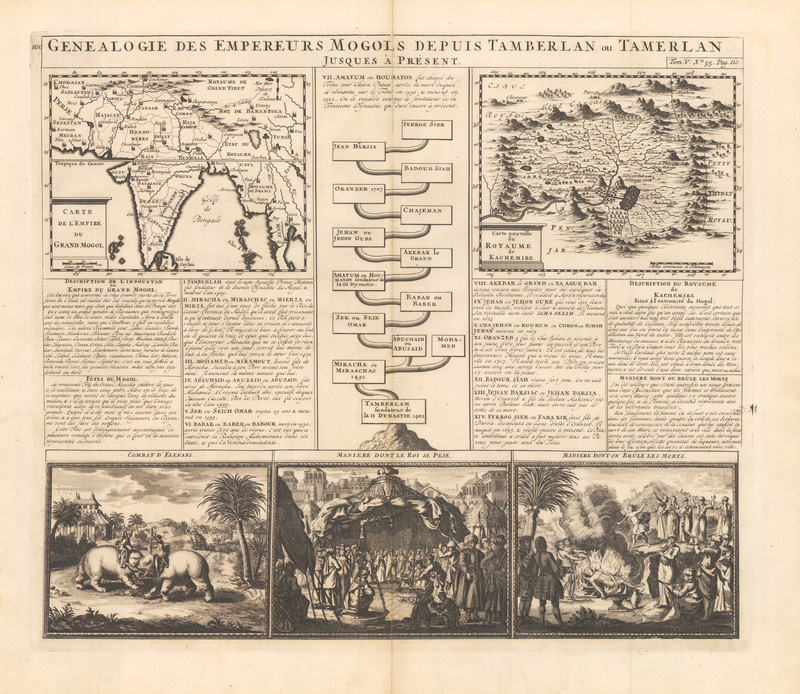 The map in the upper left quadrant is labeled 'Map of the Grand Empire of the Mogols', and features a large portion of Asia, from Persia in the west to India in the map's center, to Siam in the east, with the Tropic of Cancer neatly dividing the map in two. This map features a French scale of measurement. The upper right quadrant features a 'New Map of the Kingdom of Cashmir', which includes the Caucasus Mountains and the 'Petite Kingdom of Tibet'. This map features a German scale of measurement. Three illustrations along the bottom include ‘Elephants in Combat’, ‘The King’s Manner of Weighing’, and ‘The Manner in which the Dead Were Burned’. Tamerlane was known for his ruthlessness, for the carnage left in his path, and was often called the ‘Sword of Islam’. Though claims are made for his learning and even erudition, he did not institute new governments for the territories he overran, rather saw them as depositories of booty lying in wait for his legions to plunder. Some of the greatest ancient cities of the time were razed by 'Lame Timur', many of which never recovered. Condition: This engraving is in B+ condition. The paper is sound and the impression strong. Uneven toning is present in the borders. Centerfold separations have been repaired with archival material.